I’m not kidding, this actually is a recipe my mum gave me although I’m guessing it’s probably a pretty standard one. Plus, hers calls for a breadcrumb topping where I prefer a mashed potato one. Anyway. Moving on. 350g mixed fish (I tend to use Tesco fish pie mix or something similar to make life easier. Firstly put the potatoes on to boil for the mash potato topping. Cover your fish in milk in another pan (not your prawns as they are already cooked) and simmer gently until the fish is cooked. Set the fish milk to one side. Melt the butter and add the flour to make a paste (a roux being the technical term!) and then slowly add the fish milk first (keep some back for use in your mash if you wish) and then the rest of the unused milk until the sauce a nice smooth consistency. Add it to the fish and gently stir it in, along with the prawns. Put the fish mix into a glass dish, top with mashed potato and then sprinkle grated cheese on the top. The pie goes in the oven for about 30 minutes, until it is hot in the middle and the top is golden brown. My first perfect score! I awarded this firstly because this recipe (especially once you know it well) is very quick. 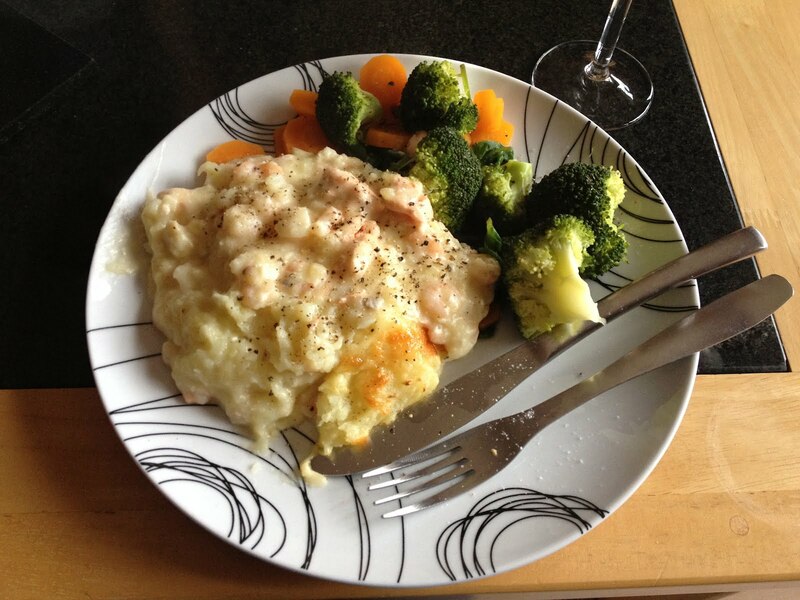 Fish is quick to cook, mash is quick to make and then you just shove it in the oven for 30 minutes while you tidy up. Sorted. The most fiddly part is the sauce and even that doesn’t take very long. Secondly, health wise this is a great meal (especially if you use semi skimmed milk like us – I doubt skimmed would even work but feel free to try and let me know!) as fish is great for you and you can serve this with as many vegetables as you like. Brilliant for us ‘5-a-day challenged’ people.